Working as a private chef has its drawbacks and its perks. 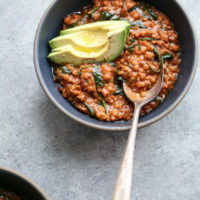 One of the positives was that my clients would often pass along interesting dishes that I might not have otherwise tried, including this red lentil curry recipe with spinach. When I was cooking for more than one family on a weekly basis, I would get completely burnt out. My biceps constantly ached from lugging groceries. I began resenting perfectly nice people who I’d built a relationship with over the years for being difficult to communicate with or making fussy, last minute requests. Worse, I was so exhausted by the time I got home that I rarely had the energy to give myself similar levels of self-care in the kitchen. If you’ve read my book, then you know these were the pre-Wellness Project years when I really let myself unravel. But once I was able to recognize my descent from Health Mountain for what it was, I quickly started taking measures to limit my professional cooking. This was no easy feat, considering I needed these odd food jobs to make a living. Keeping this quadrant of my professional patchwork quilt to one client a week was necessary though for my own self-preservation. It allowed me to truly embrace some of those other perks, mainly using the time commitment as a way to structure my week, try new things in the kitchen and be creative on someone else’s dime. And by pairing back my professional cooking, I was able to create more time in my own routine to meal prep like a pro (more on my tips for that here). 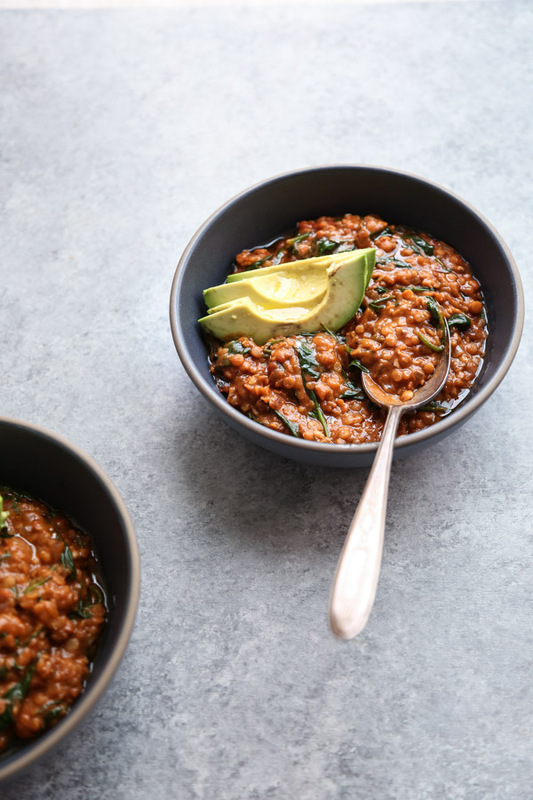 This red lentil recipe from Naturally Ella was one of the dishes that my weekly client requested I make for her once, and it has become a lifelong fan favorite of this site. I’ve been following Erin’s work for years and love her beautiful aesthetic and eye towards healthy dishes. 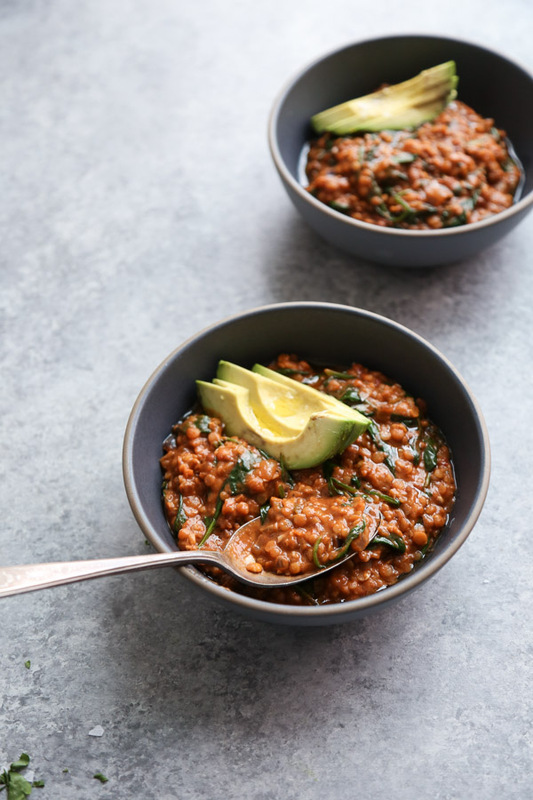 We were also both featured in Food & Wine in the same issue for our healthy takes on comfort food, so there’s no surprise that this simple lentil curry was such a hit for me and my clients. 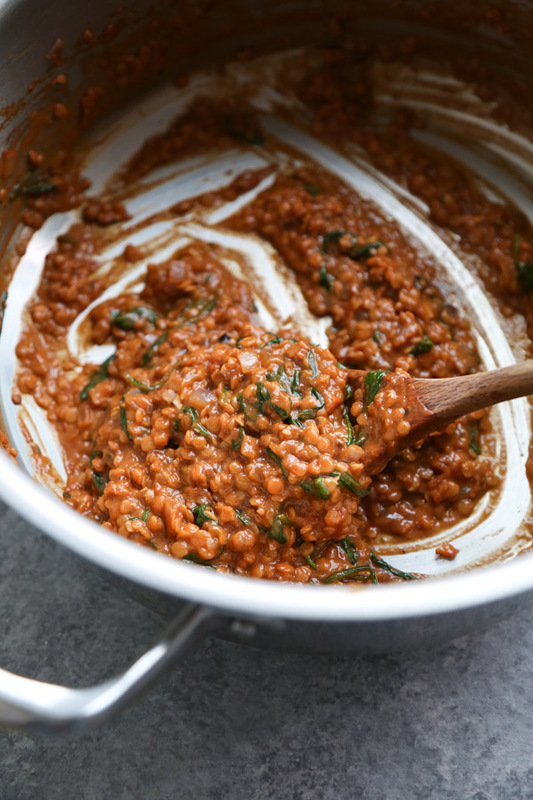 I made the one pot red lentil recipe even easier by using ground spices. I’m really terrible about keeping whole cumin seeds in my spice cabinet, even though I know the ground versions aren’t as flavorful. One of my tricks, which I’m always teaching in my cooking classes, is to make sure you’re giving the dried spices a little bit of time to toast on the bottom of the pan before you add the liquid, in this case coconut milk. The direct heat will invigorate their flavor in a way that adding them directly to water or broth never will. In this case, the end result tastes so great, I continue to go with convenience over authenticity for the masala spice blend. There’s an new video below showing you exactly how to make the lentil curry from start to finish. I can’t wait for you to try it for yourself. My jar of red lentils has gone untouched for a few months since I’ve been off FODMAPs. But as soon as I reincorporate legumes, this masala red lentil recipe will be the first that I return to. Even with the wilted spinach, the dish keeps really well in the fridge as a make-ahead meal. I usually eat it alongside quinoa or veggie patties. It’s just the kind of stick-to-your ribs without clogging your heart comfort food that I love this time of year. You know, when it’s supposed to be April 16th, but instead is January 57th. p.s. 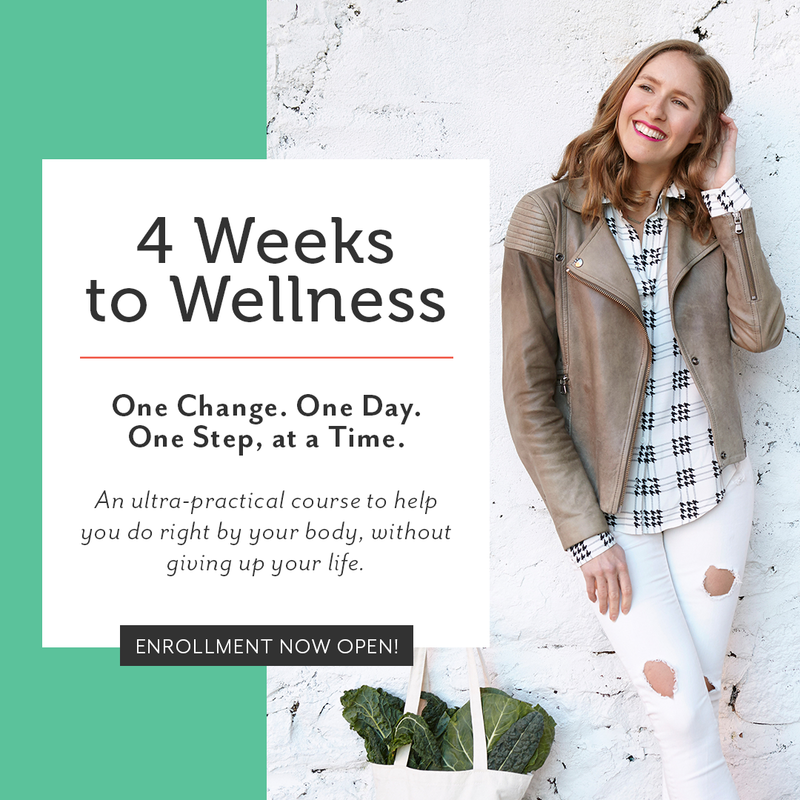 enrollment for 4 Weeks to Wellness is back open! If you want to join me for a little reset, you can grab one of the last few spots in this session here. This red lentil curry recipe was inspired by Naturally Ella. It's packed with leafy greens, thickened with dairy-free coconut milk, spiced with a mix of Indian anti-inflammatory ingredients, and finished with some sliced avocado. In a large stock pot or Dutch oven, heat the oil. Saute the onion over medium-high heat until soft, 5 minutes. Add the garlic, ginger, serrano, cumin, garam masala, and coriander. Cook until very fragrant, 2 minutes. Carefully pour in the tomatoes and add the salt, scraping up any brown bits that formed on the bottom of the pan. Cook, stirring occasionally, until the liquid has reduced and the tomato chunks have softened, 5 minutes. Add the coconut milk and 1 cup water. Bring to a boil over high heat. Stir in the lentils and reduce the heat to medium-low. Cook until the lentils are tender, 25-35 minutes, stirring occasionally to prevent the lentils from sticking to the bottom of the pan. Fold in the spinach and cook until wilted, 3 minutes. Serve alongside coconut rice. This is a great make-ahead meal and can keep in the fridge for up to week. You cooked for 100?! I feel faint at the idea. Great recipe btw, red lentils are the only kind of legume I can eat without, um, producing fumes. I love lentils. This looks perfect for the 100th snow storm we are in the midst of in Chicago. Yum. I just made it for breakfast! Delicious. yay hel! thank you for making it! This looks like a real keeper. Looking foward to trying it. I just discovered your blog & spent the evening reading & pinning your recipes. So artfully photographed too. Love it. My new favorite recipe! Hearty, fragrant, delicious and even loved by my six year old. Definitely made with love! I am now making it for a second time and I almost always just try recipes once for creative fun. Thank you! Oh, my. This was so delicious. Especially reheated! yay! I’m so glad! thanks for making! Can you provide the amounts if we have cumin and coriander seeds please? Thank you. I’d get those from Naturally Ella’s post on spinach and lentil masala. My recipe is doubled, so just check there for the spice measurements and double them. Enjoy! Very delicious! I didn’t have red lentils, but it was great with green (just took longer to cook). Will be making again very soon. I even liked the left overs, and I’m very picky about leftovers. Microwave was fine for that. Thank you for sharing! Thanks for making and reporting back! So good to know it worked with green lentils too. Did you have to use more liquid? Glad you’re enjoying leftovers! I did end up having to add half a cup more liquid since the cook time was so much more. In making it again, I just precooked the green lentils, and that was much better! absolutely delicious, just cooked it and can’t wait to re-heat it tomorrow for lunch! amazing! 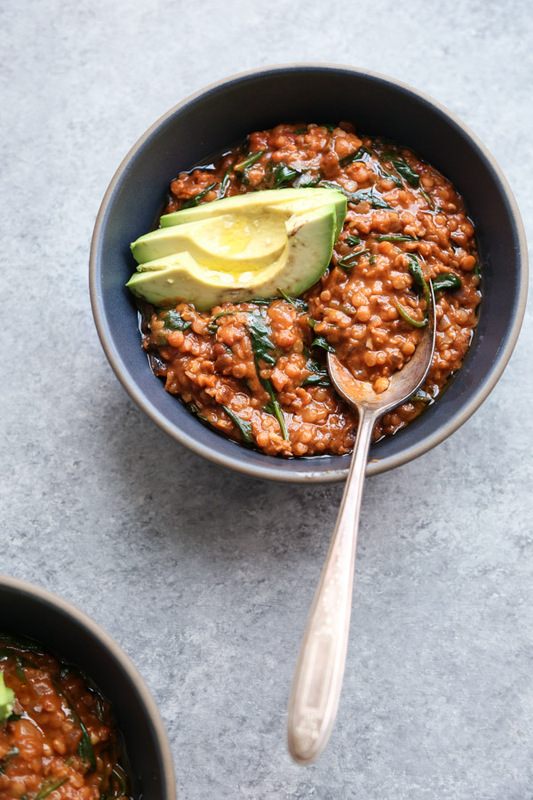 so glad you tried this red lentil recipe! it’s great for make ahead / brown bagging for lunch the next day! lucky you. Thank you for this fantastic recipe! I had it on my to-make list for quite a while; finally got around to making it today and it was a huge hit! We like spicy, so I added 2 teaspoons of red chili flakes in with the spices. So delicious! I will definitely be making this again. I made this for dinner tonight, it was FABULOUS! Even my picky kids ate it! This recipe will definitely be going into my dinner rotation! When you say coriander, do you mean fresh or ground? Thank you, thank you. You already know this is a great receipe but let me tell you why it is one of the best. I have Multiple Scerosis which, as i’m sure you know, affects my body (hands specifically) and my short term memory. So No i don’t have a stove but i do have an electric wok. This is a perfect receipe for the wok. I buy my veggies cut up and everything else is a staple in my pantry with the exception of the coconut milk. No problem it will be from now on. I can’t remember the last time i actually cooked something so thank you for that. I hope to see more receipes that i can make….my children will be so greatfull. Would it be possible to make this in the slow cooker? Probably! I’m not sure of the timing though. If you give it a try, report back! I made this exactly as you prescribed and it was completely delicious! Thank you so much. It is going to become a staple! I have the idea to substitute the coconut milk which is highly calorific for almond milk for a change and up the spice a bit. I want to make it more often and can’t face the coconut milk calories every single time even though it is fabulous! Ha….. I am looking forward to making it with almond milk later. Thank you so much for a gorgeous recipe and photos! Can I substitute the dry lentils for canned lentils? Or does it need that longer cooking time for the liquids/flavours to thicken/absorb? Absolutely! I would let some of the sauce thicken though before adding them. Simmer it without the lentils for at least half the time mentioned or it will be too soupy. Good luck! I, too, made this with green lentils tonight. (It took 35 minutes to cook – not bad at all.) And it was great! I actually use a half a can of tomato paste instead of diced tomatoes out of necessity, and it was still very tasty and filling. Something I have been curious about: when a recipe calls for lentils, do they expect them to have been soaked overnight? I never know when cooking with lentils, and I can never seem to get my lentils soft enough, even when following recipes. Is there something I should be doing to prepare lentils before cooking with them? not usually, but you certainly can! if you soak they will cook slightly faster and require a bit less liquid. I didn’t soak mine for this one. To get them soft you might just have to simmer a little longer. Lentils are tough to judge – you’ll always want to cook to taste. yay! i’m so glad Jillian! I have a go-to red lentil recipe, but it was getting a little stale. Found this on Pinterest and made it last night. I increased the amount of spices a bit and used a jalepeno pepper instead of a serrano because that’s what I had. Served it with a garnish of cilantro and avocado. It was delicious. I set the sriracha on the table because it wasn’t very hot (and we like to breathe fire), but it was so delicious that we didn’t even use any sriracha! One of your commenters mentioned that they added red chili flakes, which I might do next time, but like I said, it’s delicious without the heat! And I think the best part is that I always have all of the ingredients on hand, so I can make it without a special trip to the grocery store or additional line item on the grocery list! This recipe is ridiculously delicious, thanks Phoebe! Good morning Phoebe, i’m making this wonderful recipe again. Thought you might like to know of some changes i made this time. Since frozen veggies seem to be the order of the month, both inside and outside, i added frozen california blend. It might need to cook a little longer. I have also put in some tumeric. If it tastes as good as it looks it should be outstanding. I’ll let you know how it goes. Stay warm. Looks beautiful, dying to make, but was wondering about using dried lentils… I’m not that experienced with lentils & just wanted to know if they should be pre-cooked or just added dried? I am single and living in HOT SW Florida. This will freeze won’t it? I make any kind of recipe. Doesn’t have to be for cold weather. so glad I stumbled upon this recipe. I have already made it twice and we love it! I used half and half the first time and just 2% milk the second time and each time was very good. I love the creaminess of the recipe and the spice combination! Thanks for sharing! I loved this dish! I took a shortcut by using an already made Ginger & Garlic paste (mine was by Smith & Jones product of India). It saves a lot of time when I prepare Indian dishes! This is the 2nd time I’m making this dish in a week. The coconut gives great flavors. I covered the dish the entire cooking time which made the steam give softness to the tomatoes and then the spinach. Bravo on such a great dish! Thanks Lenore! I’m so glad you liked it! Never used one of those premade pastes before but will have to look out for one at the market! Made this last night. It was fantastic! Made this for dinner tonight; it was delicious. We have enough leftovers for tomorrow night also and I’m sure it will be even better. This is definitely going in the rotation. Thanks! My first foray into cooking with lentils. A very easy recipe to follow, can’t wait to try it tonight when my hungry husband comes home. I’m making this now – should have asked earlier! Using split lentils. It does not specify whole vs split so in wondering if I should cut down the cook time! So I cooked it about the same time as the recipe said with split lentils (I tasted part way thru to check). This turned out delicious!! I’m still eating it from Sunday! Great easy cold weather dish! just to add to the accolades for this amazing recipe … I made this tonight and it definitely ranks in my top 5 favorites of my entire dinner recipe rotation. I used light coconut milk and upped the spinach to 8 oz. This tastes exactly like a dish at our favorite Indian restaurant. Love it, thank you so much!! This was soooo good!! My boyfriend and I, who are total meat fiends, both said it was one of the best meals we’ve ever made. I don’t even really like lentils, and I still want to eat it every day. Thanks so much for sharing!!!! Mine came out a bit too sweet. Added a tablespoon of lemon juice and voila! Delicious! really? did you per chance use sweetened coconut milk? If so, I’ll make a note on the recipe. Nothing in there should be sweet! I’m a vegan college student and have made this 2-3 times a month since I found it! Delicious, quick, cheap, and healthy. Thank you for this staple in my meal prep routine! Allergy to coconut milk. Can you substitute yogurt for the coconut milk? definitely! it will just be a little tangier. I would add 1/2 a cup and see how it tastes. You can add more depending on color and taste. I would sub 1 1/2 cups veggie stock for the coconut and just add the yogurt off the heat at the end. Hope this helps! Just made this for dinner tomorrow. So simple and so so so delicious! Yum. Can’t wait for tomorrow. Did you have to soak the lentils? If so, how long? Also, think I can use a crockpot for this?! definitely! i’m not an expert but i would say cook on low for 4 hours or so. 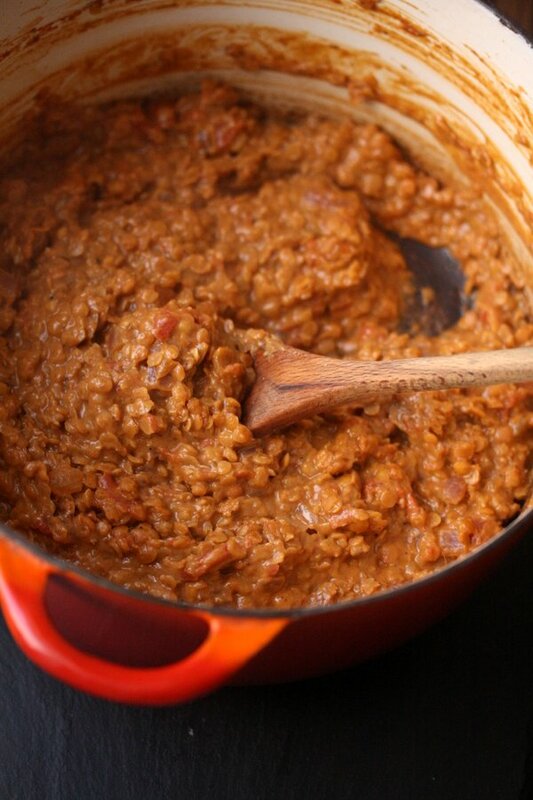 you don’t need to soak the red lentils – they cook quickly as is! This is a delicious dish & easy to prepare. Thanks for sharing a great recipe !! 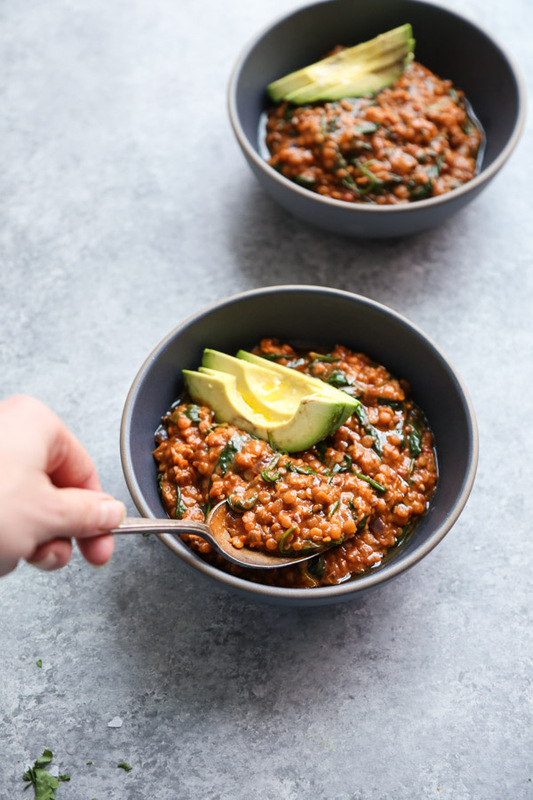 We were just discussing about a big jar of red lentils we have in the pantry last night and while catching up with our favorite blogger friends after our Easter break, BOOM; we stumbled upon this majestic recipe! Never had them with coconut milk,and are definitely trying them within the next couple of days! Thanx so much for this dear Phoebe! This is so amazing! I’ve been making a double batch and then having it for a super healthy lunch. Makes enough for nearly two weeks, unless my husband gets into it. I’ve been adding whatever greens we have in the garden, lately cabbage and kale. Works beautifully in this recipe. Thanks! Have you made this in the insta pot? I’m a beginner with the insta pot but I love it… but don’t know how to convert times…. etc. Also not sure coconut milk would work in insta pot? sorry I’m no expert either. coconut milk should be fine though! I’d guess it takes about 10 minutes. I just made this in the instant pot and cooled it like I have other dal recipes. I soak lentils in hot water for an hour and rinse well with cold water before cooking to keep the foaming down and reduce gassiness. Sautéed everything in the instant pot first and ressure cooked for 20mins, quick released, then whisked for texture before adding spinach and letting sit until wilted. No problems. Thanks for a terrific recipe!! Made it as is, except I added an extra 1/2 tsp of each of the spices…because we like bold flavours. I thought that it looked like soooooo much spinach but it cooked down to the perfect amount! It’s a keeper for breakfast, lunch or dinner! Phoebe, your blog has become my go to page to try out new dishes. So far the ones I’ve tried, have been so delicious. Thank you so much! Just found this recipe. Looks good, will give it a whirl. Usually just throw spices in but I will follow this one properly. John from Australia. Today I tried this recipe for lunch. In under an hour and with very little skill, this recipe was accomplished, emerging gloriously satisfying and healthy. Served with homemade naan roti, this is a perfect recipe. I love this recipe but when do you add the salt? I can’t seem to find it in the instructions. wow – you are so right Stephanie! Can’t believe hundreds of people have made this and never pointed it out. Adding now. you can’t go wrong though. Phoebe, so glad I found this recipe! We have made it (double batch) a few times now, varying between the vegetarian recipe and adding chicken. We sent it to both of our kids…they report that apparently lamb is pretty amazing in it as well. I spend a lot of time in the gym, and this dish is not only full of everything I need to fuel my body, but it is absolutely delish. I heat up the leftovers at work and everyone in the office is curious as to what smells so amazing. Def a staple in our (and our kids’) household. yay! I’m so thrilled greg! Made this last night in the instant pot and it was fantastic. Have not made dal with coconut milk before and it gave it a richness and slight creaminess that everyone loved. The added spinach made me feel better about our Indian dinners, that often lack vegetables of feel like they are superfluous. I did change it up with some extra traditional Indian spices, and added 1/2 T cumin seed, 1/2 T mustard seed, and 1/4 t Asafetida just before sautéing the onion and 1T of fenugreek just after adding tomato. I’m sure it would be delicious without, but these are what has given my past efforts at dal the real Indian restaurant aroma and taste. if you have those spices on hand, that’s wonderful!! my audience doesn’t usually have such a robust pantry but glad you made it more authentic!! This has become a go-to. I love it, make it once a month. Thank you so much for posting it! Purchased Red Lentil first time a couple of months ago as I needed 1/2 cup to include in a Healing Turmeric Cauliflower Soup. So I’m left with a 2 lb bag and had to find a recipe in which to use them. Came across yours on my search; as my husband and I enjoy curry, and are trying to eat healthier in our later years, I decided to try it last night. Made a couple of substitutes with what I had in, i.e. Thai Chili peppers (2) and frozen spinach but I’m sure I did not change the integrity of the recipe. This is definitely one I will make again. YUM!!! Cheers from Suzanne in Ontario, Canada. Perfect ingredients. Perfect taste. I enjoyed the recipe very much. Great meatless option too. This was delicious!!! I didn’t add onion, but I don’t think it made much of a difference.